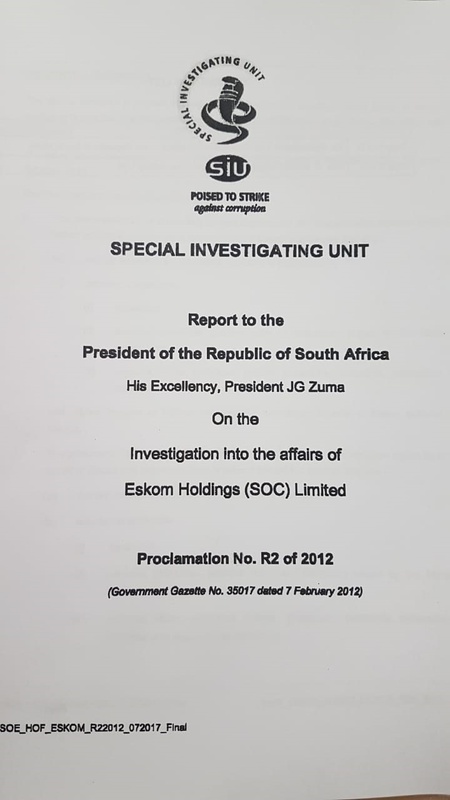 The front page of the final SIU report, which was handed to Jacob Zuma in 2017. R14.5 trillion – that is how much a Special Investigating Unit (SIU) report found Eskom’s “self-created emergency” cost the country in emergency coal contracts during the first round of load shedding in 2008. The report containing this staggering figure also found that the country’s first load shedding experience may have been partly engineered by Eskom employees in order to sign emergency contracts to benefit coal suppliers. Some of these were 10-year contracts, entered into without proper tender processes, and which only expired in December last year. The report, which City Press obtained, was handed to former president Jacob Zuma in July 2017 after a four-year investigation and was never released by the presidency. “The figure of R14.5 trillion is ... the total value of all coal contracts entered into during the emergency-period negotiations at Eskom. The value is the cost of the contracts for the entire duration of the contract,” SIU spokesperson Nazreen Pandor wrote in a written reply this week. This is many times South Africa’s entire 2019/20 budget for which expenditure is expected at R1.83 trillion. The Organisation Undoing Tax Abuse’s energy portfolio head, Ronald Chauke, said he was aware of the SIU’s R14.5 trillion claim. The SIU report found that the 2008 power crisis was partly caused by Eskom officials, who ignored repeated warnings that coal stocks were running low. “The emergency situation that Eskom found itself in was self-created and thus, could have been avoided by the exercise of reasonable care,” the report found. “The board of directors did not respond to warnings that the coal stocks were reaching dangerously low levels prior to January 2008 and that the threat of load shedding was a strong possibility. At the time of the crisis, Eskom’s chief executive was Jacob Maroga and the chair of its board was Mohammed Valli Moosa. The report further found that at the time of the emergency, Eskom was forced to buy coal from mines which were fetching between R1 400 and R1 600 a ton on the export market. Eskom, which was buying coal for about R150 a ton, had to increase its prices significantly to divert coal meant for export markets to power stations. This, finds the report, was responsible for the R14.5 trillion figure. 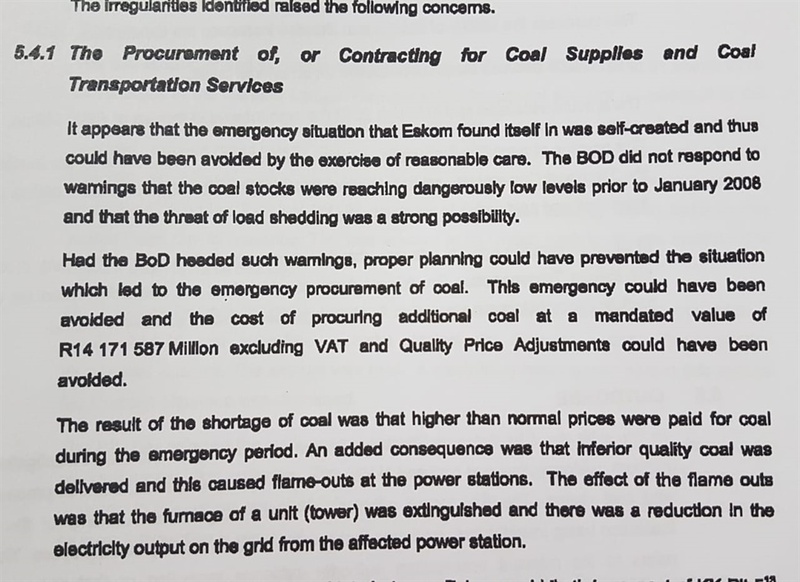 The report further reveals that some of the companies which Eskom bought coal from in the emergency supplied such poor-quality coal that it caused “flame-outs” at power stations. This is when coal will not burn and extinguishes the flame of a power station boiler, reducing the station’s overall output and further reducing power to the grid. But these companies will likely never be brought to book because Eskom told the SIU that it could not identify the companies which delivered substandard coal because the coal was burnt as soon as it was delivered during the crisis. The report, which followed an investigation proclaimed in 2012, gives credence to claims by two other investigations: one by international law firm Dentons in 2015, and the other by auditing firm Deloitte in 2011. Both found that the 2008 load shedding was engineered to benefit certain companies. The Dentons report further found that load shedding in 2014 benefited diesel companies which had mushroomed from nowhere and were unknown in the industry, suggesting that they may have been set up in anticipation of the load shedding. The report also found that a 10-year coal supply contract that expired in December, which flowed from a short-term contract awarded during the emergency, was irregular and flouted all tender processes. 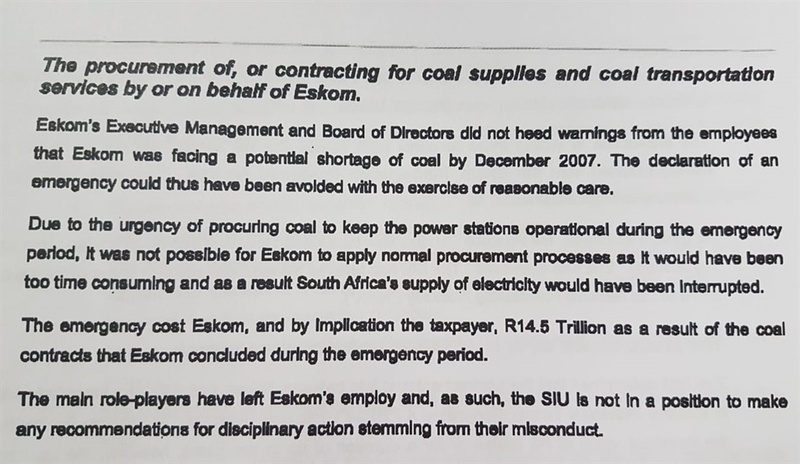 SIU investigators found that a year after the emergency, Eskom officials directly appointed a company to supply coal for 10 years without going to tender. The contract, awarded to four companies, was to deliver 490 million tons of coal at a cost of R164 billion. One of the companies was a broker that did not own a mine at the time. “The contract was the only contract [out of the four] negotiated without following the request for proposal process,” the report found, adding that this violated constitutional principles of procuring goods fairly and cost-effectively. “It is clear from the evidence gathered that the negotiation of the ... contract was designed to circumvent an open tender process,” the report states. Investigators pointed out that the company’s appointment raised significant questions because in July 2008, Eskom had decided not to buy coal from middlemen and other coal traders, and only to buy from companies that owned mines or had valid joint ventures with mine owners. “Broker fees, which increased costs, were sought to be avoided,” said the report. The directors of the company, whose names are known to City Press, did not respond to requests for comment send yesterday morning via WhatsApp and SMS, although one received the request but did not respond. In January 2008, the report found, Eskom’s coal stockpiles were running dangerously low – well under the acceptable minimum 20-day level. The Arnot Power Station in Mpumalanga ran out completely, while a further eight power stations had stockpiles varying from between four to 16 days. This forced the Eskom board to declare an emergency, which allowed officials to approach mines directly and buy coal without going to tender. A management accountant, whose job was to monitor coal stock levels at Arnot, told SIU investigators that before the 2008 load shedding, she had warned her bosses that the station would run out of coal by the end of 2007. From the SIU report: The woman who Eskom bosses ignored. “She was called into a meeting and was told that she was wrong and did not know what she was talking about,” the report states. The woman’s affidavit, quoted in the report, says: “I kept sending emails to the senior coal manager of Arnot, informing him that the financials were showing that there was going to be a possible shortage of coal by the end of 2007. Her testimony prompted SIU investigators to conclude that “the warning signs that indicated that the stock levels were reaching precarious levels were ignored”. Eskom said it would only be able to respond to questions next week.